The Ski Story: Tuesday of Last Week. this was a very enjoyable post. question...did you stand there til matt could get the camera for you? do you always have the camera with you while you are doing dishes? or did you re enact the knife on foot for a photo? haha. Yikes! Scary cut! Glad you still have your finger!! And...Ugh! The knife on the foot pic brought back a scary memory for me. 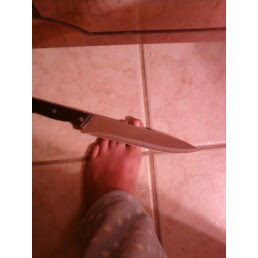 While putting dishes away, years ago...somehow a knife slipped out of my hand and landed point DOWN on my big toe. I think it was one of the only times I was so scared to look down. Thankfully, the very sharp chopping knife just pricked the top of my big toe. Tootsie saved!!! Oh! And did you know that when someone tries to reply to you via email, a pops up?? Whew! You lucked out! I cut my finger yesterday, and I've had to replace the bandaid at least 6 times already! No stitches necessary, just caught it in a bendy spot. No idea on the hot feet thing. Hmmmm...Try WebMd?